The Norwegian Glacier Museum offers entertainment and education for the whole family. The Norwegian Glacier Museum is a official visitor centre of the Jostedalsbreen National Park. News. Here you find the latest news from the Norwegian Glacier Museum. The Norwegian Glacier Museum & Ulltveit-Moe Climate Centre are measuring the front position of two glaciers in Jostedalsbreen National Park. The data shows recession in 2018. The front of Vetle Supphellebreen Glacier on October 11 in 2018. The Vetle Supphellebreen glacier in Fjærland had been advancing the three previous years, but in 2018 it receded 6 metres. We re-started the measurements in 2011, and the glacier have been relatively stable. The glacier was also monitored in the period 1899-1944 and receded in total about 450 metres. Haugabreen Glacier in early October 2018. We also monitor the front position of Haugabreen Glacier in Jølster. The data shows a recession of 16 metres in 2018, and the glacier have been shrinking 69 metres since we started the measurements in 2013. During the past couple of years glacier streams are becoming visible in the glacier foreland, which mean it can be difficult to access the glacier for guided hikes, without getting wet, in the future. Bøyabreen Glacier October 1 in 2018. Other more well known glaciers, like Bøyabreen and Supphellebreen, are also beeing recorded for the future by taking photos. The glacier recession over the years have been causing problems for executing the front position measurements, but photography makes it possible to still document the glacier development. More information about glacier measurements is available on the website of The Norwegian Water Resources and Energy Directorate. Here, you can read about the heavy glacier melting in 2018 and how glaciers like Engabreen and Nigardsbreen receded 140 and 81 metres respectively. 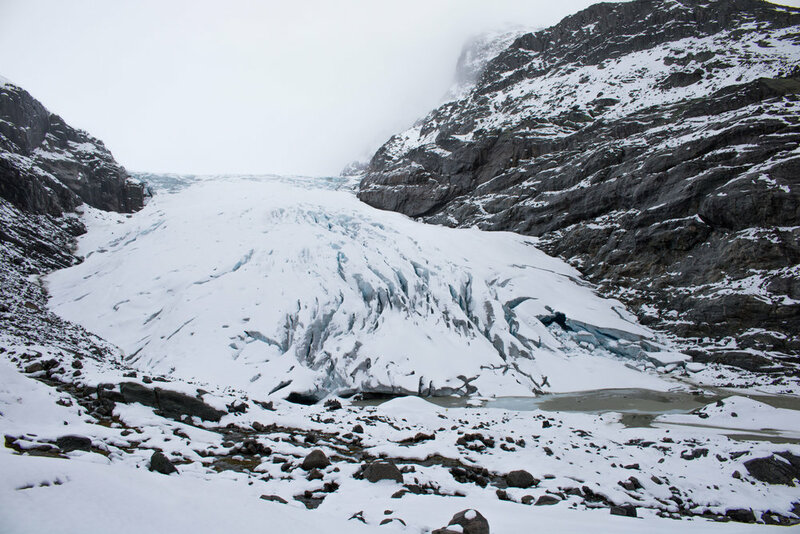 The hot summer this year took its toll on the snow and ice on the Jostedalsbreen Ice Cap. Since the advance of the late 90’s, the outlet glaciers have been receding the past 20 years. This is all part of the ongoing long term trend of receding glaciers in a warming climate. According to the World Meteorological Organization (WMO), 2018 is heading to be on of the warmest years to have been registered since the temperature measurements started in the middle of the 1800s. The glaciers are an important source of water on Earth, as 70% of the fresh water is stored as glacial ice. They contribute to a stable water supply and they are one of our best climate archives. This winter we have been working hard to renew the main exhibition. Among the new stuff is a brand new interactive exhibiton about the global warming of our planet. From April 1st you can experience The Norwegian Glacier Museum in a new way. The opening hours are 10:00 - 16:00 everyday. We have, actually, allready started the season with groups visiting during Easter. Just to let you know; there is still snow on the ground outside the museum. But we have parking space available for all guests. So don't worry! With a renewed exhibtion design, new colours and upgrades we wish you all welcome to visit us. This, alongside the allready spectacular movie about Jostedalsbreen Glacier and the Climate Change Exhibition, you can have an exciting and learnfull stay with us. Welcome to The Norwegian Glacier Museum in 2016! PS: this year we celebrate our 25 years anniversary. The measurements of annual front position changes has discovered that 2 of 4 glaciers may be difficult to survey properly in the future. Since 2003 and 1992 the Bøyabreen and Supphellebreen glaciers in Fjærland, respectively, has been part of our glacier length change surveys. We are dependent on measuring directly at blue ice in the glacier fronts, but that has gradually been more difficult to do, due to glacier retreat and deposition of snow from avalanches. The part of the galcier we get data from is actually what looks like a pile of snow, the regenerated glacier, below the ice fall. The measurements are no longer representative for how the glaciers develop, so we got no data on these glaciers in 2015. Consequently, we still take photos every year to at least record the visual changes of the glaciers. Bøyabreen in October 2015. Photo: Pål Gran Kielland. But we still have two glaciers we can survey, the Vetle Supphellebreen Glacier and the Haugabreen Glacier. The former is located far up the Supphelledalen Valley. Here we measure directly on blue ice so there are no questions about this one, which advanced 8 metres in 2015. In total since 2011 it has retreated 14 metres. Since our data series only stretch back to 2011, we can't make conclusions on its behaviour concerning climate change just yet. But we know there exist data series from 1899 to 1944 where the glacier retreated over 400 metres. We also found an old picture which we can use to compare with today's situation. The pictorial evidence is clear; there is less ice today. Vetle Supphellebreen Glacier in 1884 (photo: Steensrup, K.J.D.) and in 2015 (photo: Pål Gran Kielland). The Haugabreen Glacier is not part of the Jostedalsbreen Ice Cap, as the three former mentioned glaciers, but it is connected to a seperate smaller ice cap called the Myklebustbreen Glacier. This glacier is located in Jølster. During the past year we found that Haugabreen Glacier retreated 7 metres. Not a big number, but in total 20 metres since we started the data series in 2013. As with Vetle Supphellebreen Glacier it is difficult to make conclusions regarding climate change, but it fits with the overall long time trend with a warmer climate and shrinking glaciers. Also here we have time series some years back in time, from the period 1933 to 1940. During those years the glacier retreated 237 metres. Additionally, we also hav an old picture which tells us about glacier retreat. Haugabreen Glacier in the 1930s (photo: NGU) and in 2012 (photo: Pål Gran Kielland). Now we are just entering the winter and the glaciers accumulation season. For the coming years they need large amounts of snow to withstand the increasing temperatures during melt season in the summer.